The USAID|SUSTAIN project is a five-year, USAID-supported health project that is focused on improving and sustaining the gains made in Georgia’s maternal, newborn, child, and reproductive health services. The project works in public and private partnership with health care providers, insurers, and policy makers to improve the quality of care in each of these areas. 1.Promote quality maternal, newborn, and child health; reproductive health; and family planning products and services. USAID|SUSTAIN uses health behavior change principles to conduct communication campaigns that encourage Georgian families to seek quality maternal, newborn, child, and reproductive health services. 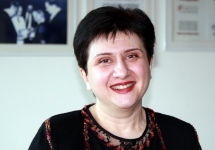 The campaigns reach the Georgian public through a combination of television, radio, print, and web-based media (including social media). 2.Ensure access to contraceptives by building strong commercial sector distribution of contraceptives and facilitating public/private partnerships with pharmacies and pharmaceutical companies. USAID|SUSTAIN uses social marketing to launch high quality and affordable contraceptives on the commercial market in partnership with pharmacies and pharmaceutical companies. To date, the project has successfully launched three contraceptive products – two brands of oral contraceptive pills and one contraceptive implant (Implanon). More than 500 OB/GYNS have been trained to provide Implanon insertion, removal, and counseling services. The project also distributes some free contraceptives (condoms, oral contraceptives, IUDs, etc.). 3.Strengthen the quality of maternal, newborn, and child health; reproductive health; and family planning services. Georgia implemented universal health coverage for all citizens in 2013, and now there is a renewed focus on ensuring that health services are high quality. USAID|SUSTAIN is working with the Ministry of Health to develop health facility accreditation and certification programs for perinatal care and reproductive health care, respectively. 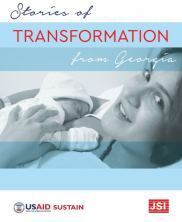 The project has introduced facility-based quality improvement initiatives, including spearheading a clinically-proven and cost-saving effective perinatal care program, which is now being implemented in more than half of Georgia’s maternity clinics. 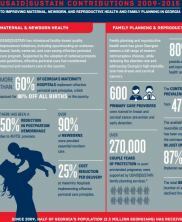 To date, USAID|SUSTAIN has trained more than 500 health care providers in effective perinatal care. 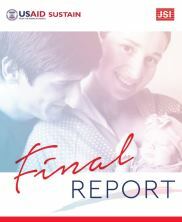 The project has helped standardize maternity care across Georgia by developing ten obstetric and neonatal clinical protocols, which have been approved and put into practice by the Ministry of Health. The project is also developing, again with the Ministry of Health, a perinatal care regionalization program, which would introduce the practice of a tiered health facility system throughout the country. To improve the quality of family planning and reproductive health services, the project has trained more than 1,800 health care providers and pharmacists. Eight hundred primary health care facilities now provide comprehensive reproductive health services. USAID|SUSTAIN also has developed an innovative parent education curriculum, which currently is offered both online (www.mshobeltaskola.ge) and in five maternity clinics across Georgia. USAID|SUSTAIN provides technical assistance to four medical universities across Georgia to introduce clinical skills practice. To date, the project has trained 50 medical faculty on curriculum development, advanced methods of teaching, and student evaluation techniques including the internationally renowned objective structured clinical examination (OSCE). Georgia’s first OSCE was successfully held for more than 250 fourth-year medical students at Tbilisi State Medical University in February 2014.